It has been a heck of a year. 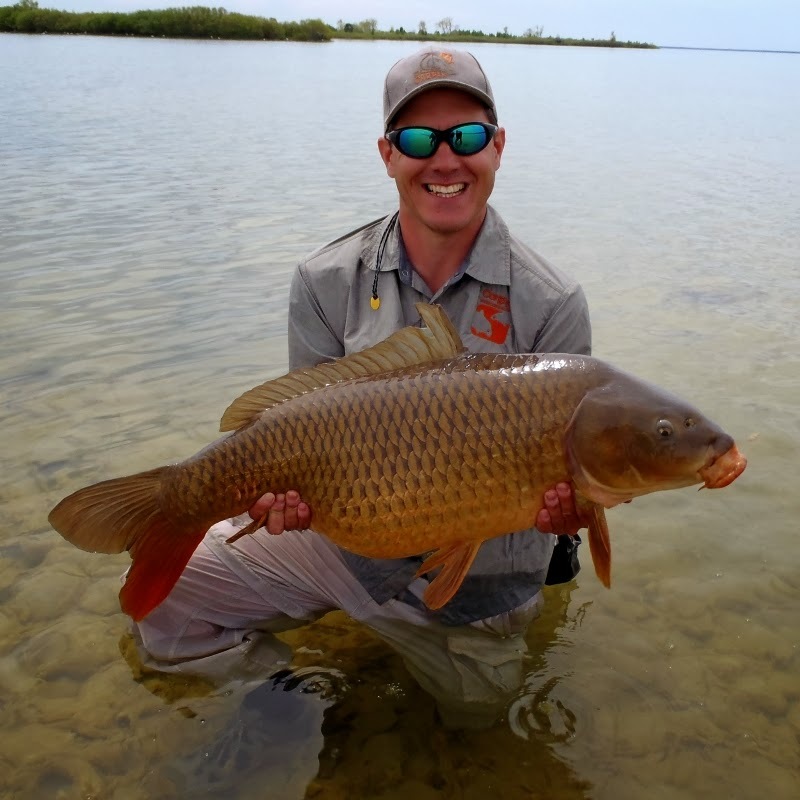 I caught a ton of carp on flies and made some good friends in the process. For a while now I had a silly personal goal for 2011. I had hoped to run the gauntlet and catch at least one carp in every month. With this 11lb carp on a proto-headstand this morning I caught my first carp of December and my last carp of 2011. Mission accomplished, I can cast off 2011 and welcome 2012 fully satisfied. This blog and I have accomplished many things in 2011. Some are only personally satisfying while others were surprisingly important even in the big picture. In April I won the MFC / OBN Fly Designer Contest with the Primordial Crust. That was really cool because at some point this year people will be able to buy one of my flies and catch some carp on it. 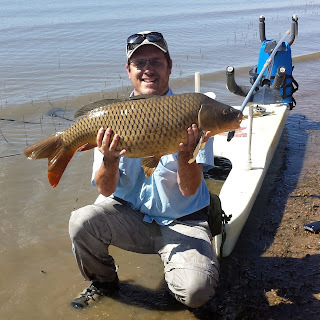 In June I went to Oregon to visit John Montana from Carp On The Fly. We had a blast in some unique conditions and caught many carp including my personal best at 23 pounds and his biggest carp of the year at 33lbs. 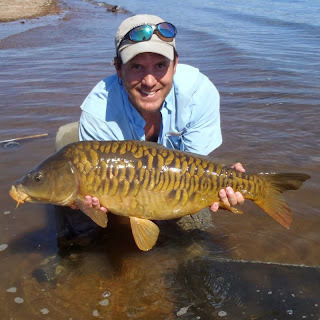 In July I happened upon what I call the carp bubble of 2011 and had my best day ever for carp where I hooked 24 fish in 6 hours. 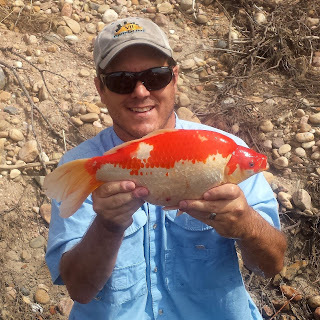 There were so many fish tailing close to shore on that day that I took an hour break to lay out on the bank, take some video and see if I could reach out and touch a tail. It was awesome. In August Clint Packo and I won the 2011 Denver South Platte Carp Slam. We had incredible luck on the beats and hooked a ridiculous number of fish while supporting a good cause. That good cause is starting to come to fruition. We also lost a ridiculous number of fish but landed enough to bring home the victory. It was really fun to win (who doesn't like to win something every once in a while) but as much as anything I have to admit that it was fun to be a big deal at the after-party. Five minutes of fame for a wall flower such as myself is always fun. In November I found the Sand Creek Oil Spill. 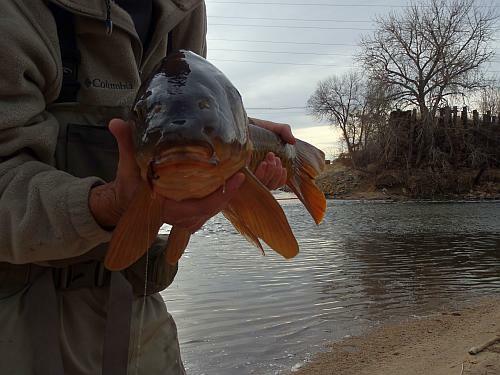 I and the Denver South Platte got a little bit lucky on this. Without the voice that this blog gives me and the help of Gregg the spill may have gone un-contained for days or weeks longer than it did. Which brings us to the end of 2011. It has been a great year, I am looking forward to the next. 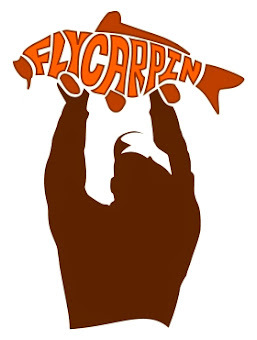 Here is to a happy new year and many fish landed for Fly-Carpin and all it's supporters. Good year...here is to another one in 2012! Yeah, I'd say you did ok.
Outta the friggin' park, dude. 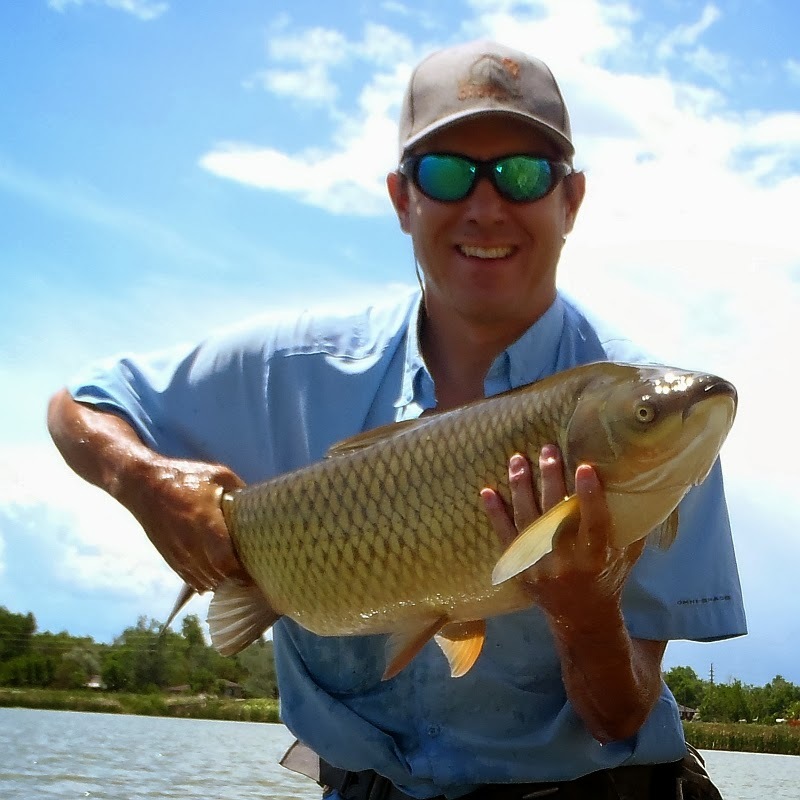 A carp on the fly in every month of the year...now that's a hell of an accomplishment. 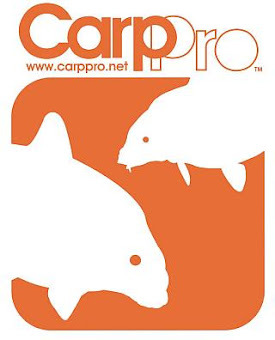 With the water still open here in Kansas (for the time being) hearing that makes me wanna break back out the carp box. I've been scouting a couple times but havn't put the hook to one since the first few coldsnaps hit. I did not do that, and it was a goal, as I only had December to go as well. And, I've a spring influenced pond where it is possible every month. Next year I'll get that December carp for my monthly carp catch. I too realized important information, lasting friends, and much pleasure with this site. You have done well and accomplished much, may next year be much the same minus a major environmental catastrophe, though I realize the effects of the spill are long lasting. Best to you, and may Zach catch a fish on his fly. John - Here is to a 20+ mirror! Ty - Thanks Ty. You have been one of my biggest supporters through the year. Means allot. HPFF - If possible, find yourself a carp river or creek! I think I vaguely remember there being some likely candidates in your area. Moving water can make all the difference in the world for winter carp. Gregg - Too bad about December. I almost got skunked this December and did last December. December is rough. Yeah, I could do with just happy go lucky events next year. Those are my favorite. It sounds like you had a great year! I just found the site a couple of weeks ago and am a big fan. I love the trouser worms and plan on making those some of the first flies I tie. How many bass have you caught on those? 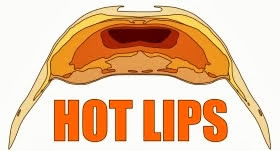 They scream "texas rigged worm" to me. Nick, Come to think of it, I havent actually caught any bass on it yet! I just dont blind cast enough when carpin to pick up many stray bass. If you are looking for a great tweener fly the MMF (aka foxy clouser) is a good carp fly in the right conditions and an absolutely killer SMB fly in almost all conditions. Nice job running the gauntlet! I'd say you had a heck of a year. I'm looking forward to seeing what this new year brings your way. David and John - Looking forward to seeing what 2012 brings your way too! Lots of carp and other species for both of you I would guess.